Union are London-based coffee roasters who have been around since 2001, and are now fairly readily available in supermarkets. Many of their coffees are sourced under their “Direct Trade” model, sourced directly from the farms and cooperatives – while this is more of a rule than an exception in premium coffee, it’s nice to see a company going into such detail about exactly how they work with their suppliers. This is their Rwanda Maraba coffee, grown by the Abahuzamugambi Ba Kawa cooperative. Union have a lot of information on their website about the farms they source their coffee from, telling you exactly where the farm is and interesting additional details such as the unusual Red Bourbon variety that this collective grows. The grounds have a wonderful aroma; sweet with a warm toasted character, red summer fruits and a soft fudge background with just a hint of fruit blossom. Brewed, the toastiness is more pronounced and the sweetness fades, but there is still a fruity freshness to the aroma. In the mouth, it’s gentle without quite becoming weak – there’s just a slight, almost chocolatey sweetness and a delicate tannic dryness in the finish that has you reaching the bottom of the mug distressingly quickly. 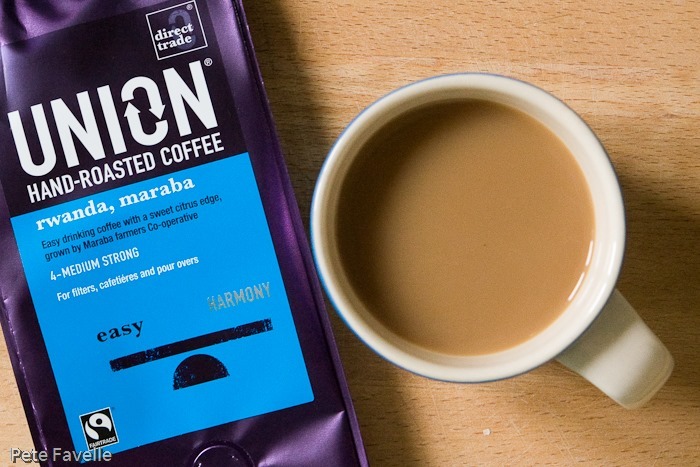 It’s a slight shame that the fruitier aromas don’t come through more obviously in the flavour, and it’s not a coffee for those who like their caffeine to be big and bold, but that doesn’t stop it being a fantastically easy drinking, every day cup. 4 stars.